ARDF-FjwW is a windows program for using the chip cards system SPORTident® of the AES Arnstadt company and allows time keeping and evaluation of ARDF competitions. A detailed description is here. FjwW support languages English, German, French, Dutch, Czech, Polish and Russian. The program was successfully used many times at German ARDF competitions as well as in 23 countries: Australia, Belgium, Bosnia/Herzegovina, Bulgaria, Croatia, Czech Rep., Finland, France, Great Britain, Hungary, Korea, Lithuania, Netherlands, Norway, Poland, Romania, Russia, Serbia, Slovakia, Slovenia, Sweden, Ukraine and USA. FjwW offers a comfortable display of the current results at any moment during the competition with the Internet Browser on an unlimited number of computers. Here you can see an example. Beginning with version 8.3 FjwW is unicode and thus able to use all possible international character sets, such as Cyrillic, Arabic, Korean, East- and North-European special characters and so on (screenshot of Dutch language version at the left side). that describes the usage and the possibilities of the program and the additional tools, primarily by pictures with accompanying text. The description will be extended continuously. Sorry, in the moment it's only in German (looking for a translator to English ...). 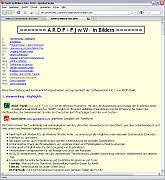 The ARDF-FjwW software isn't freeware and can be obtained from the author only. The last version of FjwW, delivered to registered users, is V19.2 (19.2.1.2) dated 9.3.2019 . If versions didn't get to registered users, please inform the author. This version has the following new features. Here in details. The 'Name Lists' are splitted into three files for German (3872+427 entries) and international (4983 entries) participants of ARDF competitions and in IARU-R1 nominated international referees (53 entries). Lists also contain stolen, lost and rental SPORTident chips that exist in Germany. The categories of competitors in the lists are up to date for the year 2019. The 'Name Lists' enables a faster registration of all participants in FjwW, especially when competitors use their own SPORTident chip. DF1AAA, DO1FOX, DL3YDL made a short instruction that shows the handling of the SPORTident stations and FjwW at ARDF contests. Sorry, only in German. 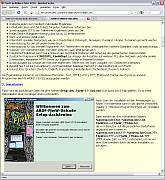 The Ergebnis-Daten-Austausch-Datei (result-data-exchange-file) format is used for passing the ARDF competition results to a third party. 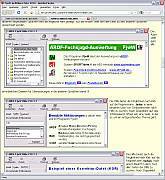 Here currently being built up a service for ARDF-FjwW-User: Hundreds of German and international ARDF competitions in EDAD format (see above) for usage in FjwW or in other programs which are able to import EDAD. 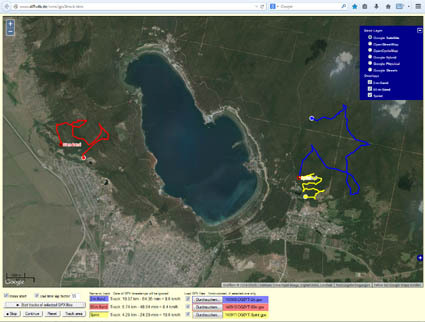 FjwMap is primarily a planning tool for ARDF competitions. You can place the locations of start, finish and transmitters on a scanned map (JPG-/GIF-/BMP formats) and calculate the optimal running courses for different categories. Also GPS data of locations can be used. FjwMap can hand over location data to FjwW. A more detailed description is in the help files of FjwMap in English or German. The program can process data of the 'Shuttle Radar Topography Mission' (SRTM, see Wikipedia). This freely or after registration accessible data is stored on a NASA FTP server. The data provides for a surface of approx. ca. 50x90 or 20x30 meters (Central Europe) the height above sea level in meters. With loaded altitude data the height is shown for a marked location at its actual position in the status bar. 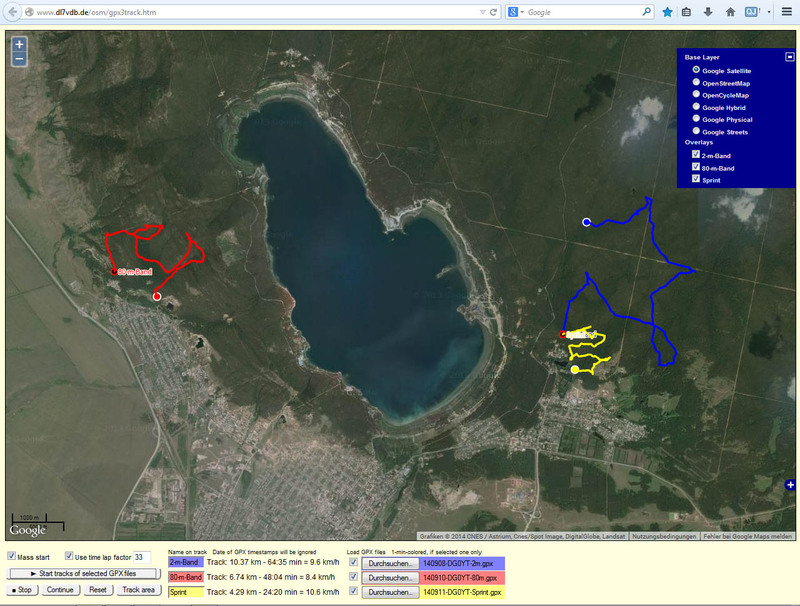 FjwMap is able to display a recorded running route from a GPS tracker (GPX file format) on the map with simultaneous display of run time, already passed route, currently active transmitter, altitude, average of speed and time-lapse function. Since V10.11 the track is being displayed permanently. Please download and test it ! FjwMap is able since V13.3.1, by using the SRTM height data (to get for free from NASA server, without registration), to show the height contour of calculated optimum route or of clicked personal route (see small picture below) in the main window. It show also the moving avarage and the total traveled climb in the statusbar. 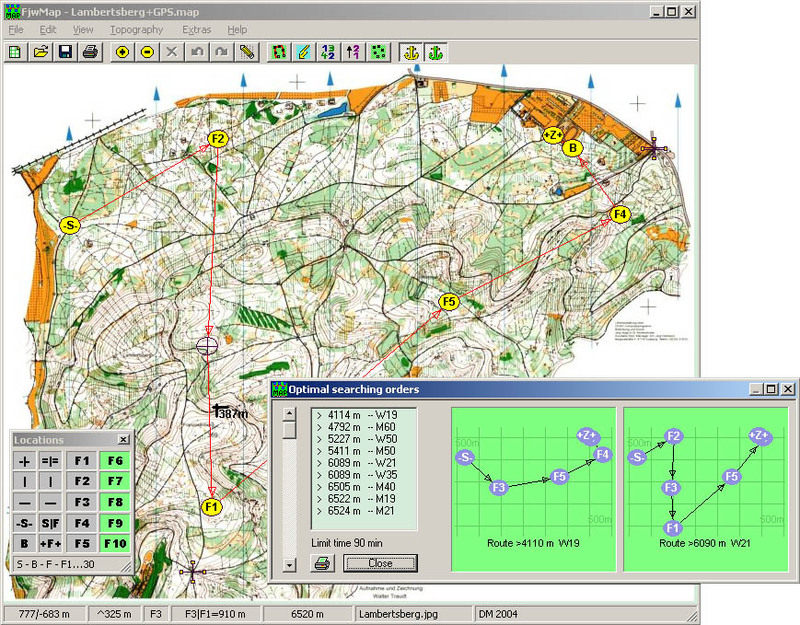 FjwMap is freeware for usage in sectors of non-commercial sport, e.g. Amateur Radio Direction Finding (ARDF) or Orienteering (OL). Other usages have to be negotiated with the Author ! The program supports German, English, French or Russian. The supplements of the last versions of FjwMap are here. As examples the maps of the 13th ADRF-World-Championships 2006 in Bulgaria and of the 16th ARDF-R1-European-Championships 2007 in Poland. 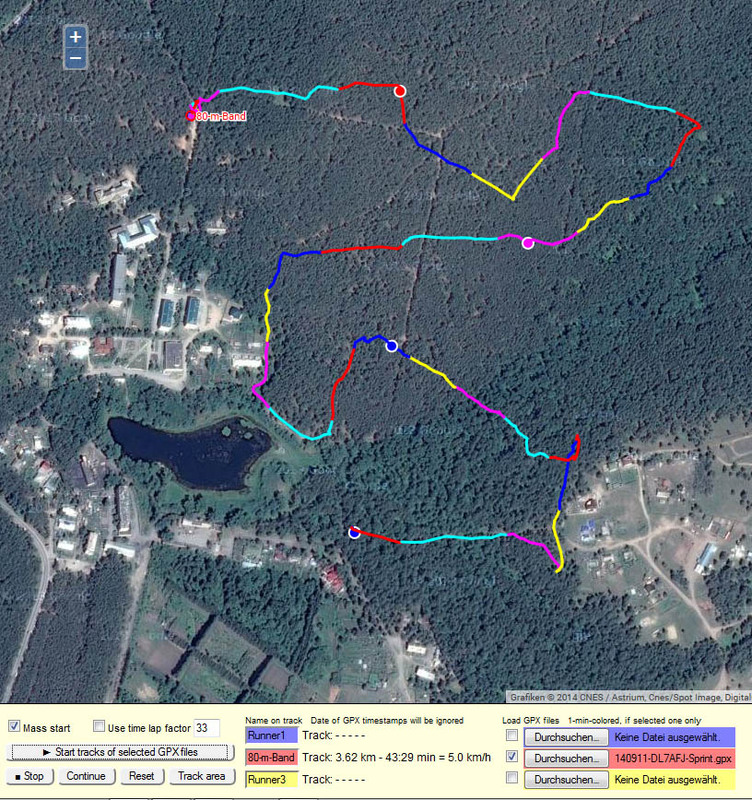 As example for the new feature of displaying a running route recorded by a GPS tracker here the 14th ARDF-Worldchampionships (Korea 2008) 80-m-competition with the running route of a German competitor in category M21. Please unpack examples above first. Error reports to the Author are welcome. it's possible to show personally running(walk) route on maps of OpenStreetMap or Google Maps. The tracks have to record with a 'GPS Tracker' and to save as GPX file. J.Guettlich, DL7VDB, DL5NBZ and other composed a extensive source index about technique, training, tactics, software and... of ARDF. A theoretical comment on dimensioning of antennas for 80-m-Receivers used for direction finding with practical conclusions. Who knows the many certificates that were issued at ARDF competitions over the past 50 years ? Here are over 325 certificates from the collection of the author and others. Anyone who wishes to contribute to this collection, please send a scan to the e-mail below. Thank you! Who knows the number of medals which were awarded at ARDF competitions over the past years? Here is a collection of more than 105 medals. Anyone who wishes to contribute to this collection, please send a photo of the medal to the e-mail below. Thank you! This system of time recording at ARDF contests was successfully in action between 1995 and 2002 and was the starting point for the FjwW evaluation program. Thanks to DL3SDO for English improvements.